I’m starting to put up some images from my recent trip to the Yucatan. The image at left is a picture of the little spring that sustained the rebel community of the Talking Cross, the Maya band that nearly drove the non-Maya from the peninsula during the Caste War in the second half of the 19th century. 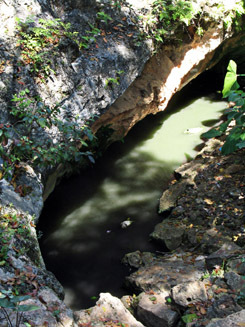 (The spring is located in present-day Felipe Carrillo Puerto.) The image is part of a page I’ve put up on the Cult of the Talking Cross (the Talking Cross revolt figures in the novel that I’m currently completing).